*Power & Versatility: It has Double Spindles and Turrets with back machining provided by an 8-station sub-turret and sub-spindle with a total tool capacity of up to 32 tools. This solution is a powerful combination of power, precision and versatility. 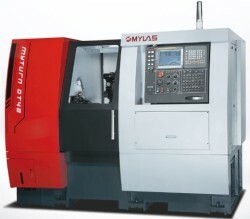 *Front Machining: VDI30/BMT45 12-Stations, Up to 24 tools, 7.5/11 kW Spindle Power, 55 mm Through Hole. *Back Machining: VDI 25 8-Stations Sub-Turret, 3.7/5.5 kW Spindle Power, 48 mm Through Hole.